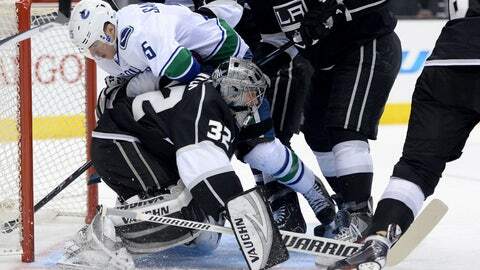 LOS ANGELES (AP) — Jonathan Quick stopped 27 shots in his return from a 24-game injury absence, Jeff Carter scored the tiebreaking goal with 7:55 to play, and the Los Angeles Kings snapped their five-game losing streak with a 3-1 victory over the Vancouver Canucks on Saturday night. Dustin Brown tied it early in the third period and Carter added an empty-net goal as Los Angeles ended its longest skid in coach Darryl Sutter’s tenure with a third-period rally. Jonathan Quick everybody. He's back. Ryan Kesler scored for the Canucks, who lost their third straight despite 46 saves by Roberto Luongo in his own return from a shorter injury absence. Quick hadn’t played since injuring his groin Nov. 12 in Buffalo, returning slowly from a serious strain while Martin Jones and Ben Scrivens performed splendidly in his place. Quick still was selected for his second U.S. Olympic team Wednesday, and the Kings put their $58 million goalie right back in the lineup immediately after activating him from injured reserve. He gave up an early power-play goal, but shut down the powerful Canucks over the final 47 minutes — including two breathtaking stops on a breakaway by Daniel Sedin in the final minute. Sutter coached his 1,000th NHL game as his team stumbled home from a winless four-game road trip. Although their scoreless streak stretched to 120 minutes, the Kings rallied to win when trailing after two periods for the first time since Nov. 14. Carter scored the tiebreaker after an exceptional play by Dwight King, who lifted Jason Garrison’s stick and outraced the Vancouver defenseman to a puck before putting a pass on Carter’s tape for his 14th goal. Carter gave no chance to Luongo, who missed three games after getting hurt Dec. 22. The veteran has been solid all season for the Canucks, boosting the gold medal winner’s chances of being Canada’s starting goalie in Sochi next month. Quick could be Luongo’s starting counterpart for the U.S. team, although he’ll have to prove he’s back in top form over the next five weeks. Quick looked sharp in the opening minutes, even doing the splits comfortably on an early save. But Kesler scored his 16th goal on a power play while falling to the ice, beating his fellow U.S. Olympian’s glove off a cross-ice pass from Daniel Sedin. The goal eased Vancouver’s 1-for-19 slump on the power play over the last seven games. The Kings generated 35 shots in the first two periods, but Luongo only had to make a handful of difficult saves. Brown finally cracked Luongo’s shutout bid on the Kings’ 37th shot, knocking home a cross-ice puck from Justin Williams — and then accidentally kicking Luongo in the face when Mike Santorelli upended him in the crease. NOTES: The Kings didn’t immediately have to make a corresponding roster move when Quick was activated because they traded F Daniel Carcillo to the New York Rangers earlier in the day. Carcillo went scoreless in his final 23 games with Los Angeles. … The 55-year-old Sutter is the 22nd NHL head coach to reach 1,000 games. The Kings scratched D Matt Greene.